The Associate Conductor Program for 2019 is no longer accepting applications. Please stay tuned for 2020! Area 5 Handbell Musicians of America is pleased to announce that the Associate Conductor Program will be offered again for our 2019 festival season. 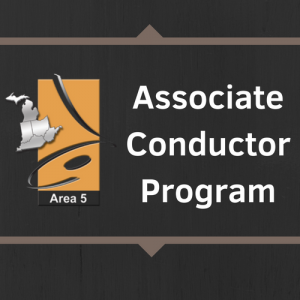 The Area 5 Festival Associate Conductor Program is a great opportunity for those who wish to work with massed handbell ensembles. Our goal for this program is to identify, train, and nurture potential new conductors for massed ringing events throughout Area 5. Through an extensive application process, this program will select an Associate Conductor for the festival in Dayton, Ohio, March 29-30, 2019. The selected associate will work closely with Lee Afdahl in a mentoring relationship that provides training in massed conducting and the opportunity to conduct one selection on the Area 5 Festival program in Dayton. The application for this program is available here. Save the form to your device to fill it out. Please note that it is two pages long. See below for the deadline and submission instructions. The individual selected will receive paid travel expenses up to $400, lodging at the event hotel during the days of his or her festival weekend, as well as all items included in the event registration. The Associate Conductor will NOT ring during the event, instead focusing their time on observing and working with Lee Afdahl to improve and develop his/her massed conducting skills. Must be a member of Handbell Musicians of America. Applicants must either have a minimum of a Bachelor Degree in Music (or equivalent training with an emphasis in conducting*) or currently be enrolled and working toward his/her Bachelor of Music and have completed at least two years of in-classroom and/or ensemble conducting. Applicants will be required to provide a minimum of two references from individuals including those who have observed the candidate conducting and observed their work with handbells. References must be completed and returned before the application is considered complete. The reference form is available here. Save the form to your device to fill it out. Applicants will be required to provide a private YouTube link to a video showing them conducting two full selections of music of contrasting styles. The video must show a full-body view of the conductor facing the camera while conducting a handbell choir. Conducting to a recording or a non-handbell group is not acceptable. The selection committee reserves the right to select no winner in the event no qualified entries are received. Deadline for submitting an application and all accompanying references is November 16, 2018. Applicant review and final selection by December 17, 2018. The associate conductor will be announced December 28, 2018. March 29-30, 2019. The event will be held in Dayton, Ohio.